For several months now I have been wishing that there would be a website out there just like ResellerRatings.com, but for employers. I've had more than one unpleasant job, and I'm sure that mostly everyone else has too. Employers want to call references, do background checks, drugs screens, and sometimes even create blacklists. But what can an employee, being only one person, do? Where are the references of the company we are applying to work for? Naturally any savvy individual can do some research online and elsewhere to be more informed about who they're going to work for. That doesn't mean that there should not be an easier way. If employees are to be held accountable, then so should employers. Dishonest and corrupt companies who treat their workers like trash should not be rewarded with an endless supply of an uninformed workforce. A few days ago I managed to find a website which can help us even the playing field a little. 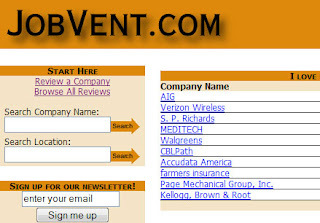 I speak of JobVent.com my friends, founded by someone very much like you and me. The FAQ reads "I'm just a guy who was unhappy with his job. I quit and started my own company which developed this website." Here's to you Mr. JobVent Guy, and thank you for allowing us to share this information. I took the liberty of posting reviews of three of my previous jobs thus far. Two of which were negative and one which was positive. I encourage everyone to submit as many of their employers as possible, in order to help this repository of information to grow. Also, please add your Digg to spread the word. Power to the people! Workers unite! Solidarność! ...what can I say, I'm Polish.